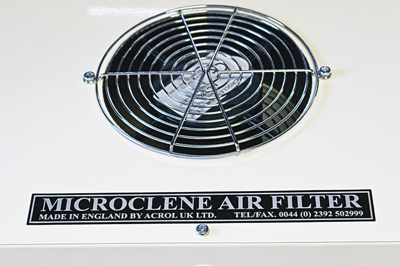 Microclene have long been recognised as manufacturers of good quality ambient air filters. Designed to filter some of the most dangerous particles out of workshop air, they have an important job to do. To this range Microclene have introduced the MC280. Designed to be suspended from the ceiling or hung from a homemade stand, it has a slightly different design and purpose from other filters in the range. This machine works over a bench and removes the fine dust created when texturing or power carving, or, with the optional carbon filter, smoke from pyrography. The machine consists of a main body which contains the fan assembly and two rows of LED lights. Also in the box are four metal plates which, once attached to the main body, create an angled hood which is designed to help direct the dust into the filter. Finally, two lengths of chain are attached by key rings to the main body from which the unit is suspended. The simple assembly took about five minutes. Due to the shape of my workshop roof, I decided to build a stand from which to hang the machine. The filter is held in place with wing nuts and is simple to take out for cleaning or replacement. Overall, the MC280 looks well made, with a good paint finish and everything feels solid and of good quality. Microclene have a good reputation for build quality and this unit doesnâ€™t disappoint. Switching the machine on, the bench was illuminated by two rows of bright LED bulbs. This is a real bonus and a great idea. The light emitted is bright and even, making every nook and cranny easy to see; the LEDs are a great improvement on the angle poise light I am used to. The fan is reasonably quiet and the exhaust is on the top ensuring the user isnâ€™t subjected to a draught. I set the height so that the bottom of the hood just cleared my eye line; I wanted the fan to be as close as possible to the piece I was working on, thus ensuring it was able to work most efficiently. I decided to test the MC280 with a pierced piece of work; I knew from experience these pieces create a lot of fine airborne dust, perfect to test out this machine. It is often very hard to see this type of fine material so, as a guide, I kept checking the colour of the filter. Over the course of a couple of days, I could clearly see that the machine was pulling a lot of dust out of the atmosphere. 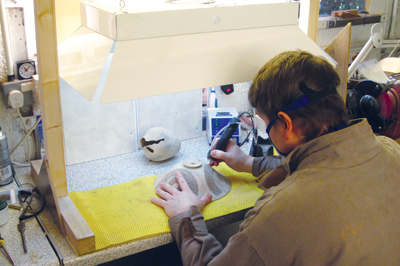 Users will still need to wear a dust mask of some description, but having the filter positioned directly over the work results in a significant reduction of airborne dust in the rest of the workshop. For anyone wanting a point of source ambient air filter the Microclene MC280 is an excellent option to explore further. With its bright integrated LED lights and powerful filtration this unit works smoothly to keep dangerous dust out of your lungs. I was surprised at how quickly I needed to clean the filter! With its hood the MC280 is not as suited to general workshop filtration; however, from the apparent power of the fan, I suspect it would do quite a reasonable job! I have only been using the machine for a few days and over that period I have adjusted the height and position a number of times. Every workshop is different and I think that in making these slight changes I have been able to get the best from this unit. Since the machine entered my workshop I have noticed a greatly reduced level of ambient dust in the air. I am so impressed that I may have to buy the MC280 so I can reduce the amount of time I spend cleaning the workshop!